Your summer events are a click away! This issue was definitely fun to put together and we’re hoping it is just as fun to read and pick out things to do! There’s so much going on this summer. 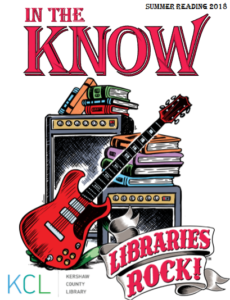 This summer’s reading theme is “Libraries Rock!” We’re looking forward to sharing musical fun with you this year at the library. We’ll tell you about two hot programs. Pantasia is a steel drum band out of Lexington, SC and they are kicking off our summer reading program! Find them at both Elgin (10:30 AM) and Camden (2 PM) on June 9th. “STEAMy Summer Afternoons” is another fun filled program going on all summer long in Elgin and Bethune where kids get to explore different aspects of science, technology, engineering, arts, and math through crafting and projects. We have a music project or two included in our schedule that fits with our “Libraries Rock!” theme! Check out the In the Know for dates and times for STEAMy Summer Afternoons. These times and dates vary. In fact, flip through the newsletter at your leisure. There is so much you could miss at a quick flip through! Keep up with us on our Facebook page. We update our events pages and keep you up to date on what is going on at the library there as well as right here on our website! Thank you for being our friends and neighbors and most of all, thank you for choosing to be our patrons. We appreciate you!